The launching point of playwright Bruce Norris’ 2010 offering is the story line established in the celebrated 1959 drama“A Raisin in the Sun,” by Lorraine Hansberry, which ends with the African-American Younger family preparing to move to an all-white neighborhood in Chicago. Act I is the paralleluniverse of the living room of the Clybourne Park house that the Youngers will soon occupy. Bev (Sandy Campbell), in mid-century full-skirted dress, perky apron, and heels, is a bundle of unnerving energy and patter as she moves around the orderly disarray of packing boxes in preparation for vacating the property. Meanwhile, a pajama-clad Russ (Mark Pinter) sits in a lounge chair; his depressed demeanor as melted as the contents he mindlessly consumes from a one-gallon ice cream carton. The doorbell rings and Bev ushers in Jim (Jason Maddy), a clergyman there at her behest to encourage Russ to get back on his feet. Here is where the production hits its first sour note: Campbell and Maddy over enunciate dialog at high-volume as if projecting to a much larger theater space. It’s off-putting and out of sync with Pinter’s compelling performance, which is measured, effortless, and conveys a man in the vice grip of torment. More story layers are revealed as neighbors Karl (Jason Heil) and his deaf, pregnant wife Betsy (Amanda Leigh Cobb) show up. Those who do their homework before show time will know that Karl is Karl Lindner, a character in “A Raisin in the Sun” who offered the Youngers money if they would cancel their offer on the house. That gambit a failure, Karl now inelegantly harangues Russ to pull the rug out from under the Youngers by taking the house off the market. Arguments ensue about the potential problems of integrating the neighborhood. While the whites fight, black housekeeper Francine (Monique Gaffney) and her husband Albert (Matt Orduña) witness the exchange and exercise the only option available to them in 1959: Mind their own business. But race isn’t the only elephant in the room. Russ’ temper finally erupts and he orders everyone out of the house, denouncing the community for its callousness and cruelty to his son Kenneth who returned home in disgrace from theKorean War. Kenneth later committed suicide on the upper floor of this home. At this point, I was still waiting for the comedy to kick in. Act II takes place in the same house, 50 years later, when a white family moves into the now all-black neighborhood. High marks to scenic designer Robin Sanford Roberts who manages during the 15-minutes intermission to transform the previously tidy and inviting living room into a squalid space disfigured by graffiti-covered walls, devoid of furniture, and sporting the missing-tooth appearance of broken banister railings. The cast returns in different roles in a different social world, at least on the surface. Perceived equality between the races is conveyed in banter about the prestigious colleges they attended, in which downtown high-rise they work, and world travel. Yet tension remains. To wit, Lena (Monique Gaffney) keeps her purse strap firmly on her shoulder, a signal that she wishes to remove herself as quickly as possible from the presence of the white couple taking possession of the house once owned by her great aunt and namesake (another “A Raisin in the Sun” link). But, first, there is business at hand. New owners Lindsey (Amanda Liegh Cobb) and Steve (Jason Heil) wish to tear down and replace the residence with an abode out of scale and character to the surrounding houses. Representing the community in opposition to the change are Lena (who gives as good as she gets) and husband Kevin (Matt Orduña). Flanked by one side’s lawyer Kathy (Sandy Campbell) and the other side’s realtor Tom (Jason Maddy), what begins as a painstaking reading and interpretation of neighborhood building covenants,deteriorates into an ugly, racially tinged scene. Yes, this is comedy but it is dark comedy in which unintended and misinterpreted words soon escalate to a no-holds bared, racially offensive joke competition. Wandering in and out the room is handyman Dan (Mark Pinter) who literally unearths a long buried secret in the back yard. Once again Pinter puts in a stellar performance that elevates the role several notches. 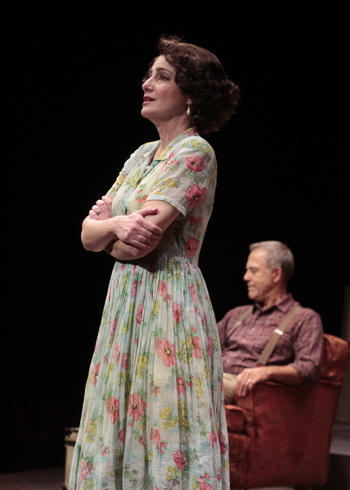 Ultimately, “Clybourne Park” fails to deliver because in recent years the San Diego theater community has seen more finely wrought plays — “God of Carnage” and “Good People” among them — in which characters verbally tear each another apart on stage.